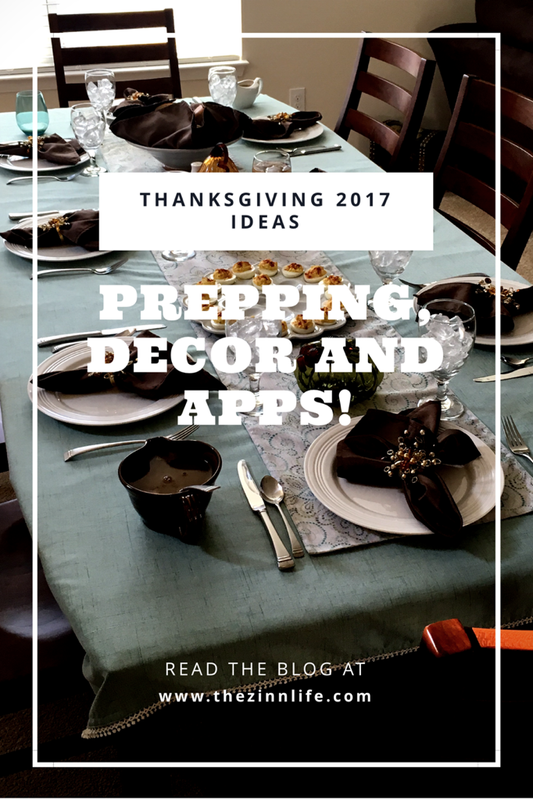 The Zinn Life: Thanksgiving 2017 Ideas: Prepping, Decor and Appetizers! Thanksgiving 2017 Ideas: Prepping, Decor and Appetizers! Guys! Next week is Thanksgiving! That is the most magical time of the year to me. I'm weird, I know. Mostly, I'm just a fat kid that loves food. And a day that revolves entirely around my favorite people AND food? Who doesn't love that?! This whole week, I'll be doing posts about Thanksgiving. Today's post is about prepping for the day, decorations and my favorite appetizers! Our Thanksgivings have become fairly routine. I love that about them. But maybe yours looks a little different. Here's some ideas on how to handle leading up to the big day! I always start with the guest list and who is going to bring what. Our guest list my us, my parents, Aaron's parents and my sister- and brother-in-law. I also think about any friends that might need somewhere to eat because no one should have to eat turkey alone! 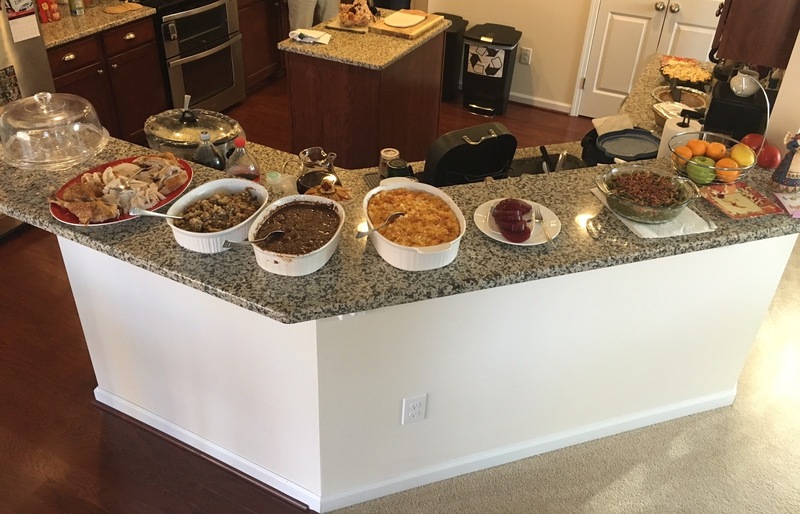 For the past three years, we've done a potluck Thanksgiving and it works beautifully. There isn't one person doing all of the work and everyone gets to bring their favorite (or new!) dish. Think about how many people are coming, how many sides and desserts you want and then split it up. For us, I do the turkey, gravy, appetizers, mashed potatoes and dessert. Mainly, I do the large things and some stuff I love. Each family then brings a side and a dessert and one family brings the stuffing, rolls and cranberry as either their side or dessert. We always end up with a good variety of food, but not so much that you live off leftovers for a week! However you divvy it out, make sure that everyone is bringing something. They can decide what to bring, just let them know if they're bringing a side or dessert. Wine is always a good choice for a last minute guest, too! Here is our spread from last year! 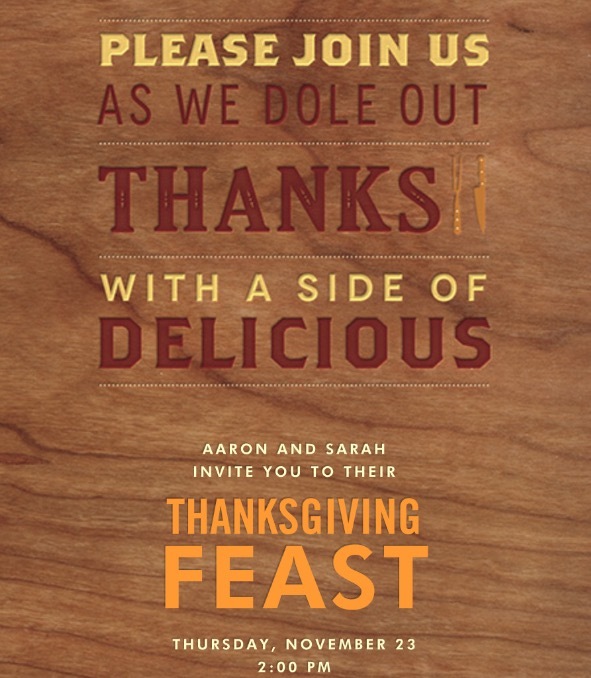 We don't do a lot of fancy parties, so I like to make Thanksgiving special by using the fancy china and sending out actual invites. It's probably more fun for me than anyone else, but whatever. It's my party, I do what I want. This is our invite for this year! E-invites are the way to go. I use Paperless Post for mine and try to find the free ones. I send out the invites the first week of November (lest anyone think that I will not be hosting, even when 6 months pregnant!). In the notes, I tell people what to bring (sides and desserts) and when we need to know by. That way, we don't end up with multiple of the same dish. Thanksgiving, for me, is the time to bust out all my serving dishes that I registered for when we got married. It's the time to use all the fancy stuff that only gets used a few times a year. And believe me when I say, I use it all! For the table decorations, I don't use a lot. I've bought some pretty tablecloths at Bed Bath and Beyond that fit my gigantic table. I use place mats and pull out the fancy napkins (we usually just use paper towels) and napkin rings. Since most of my linens coordinate, I switch out what I use each year. I don't really use many decorations on the table because we end up with a pretty full table every year. Cute, decorative salt and pepper shakers are great because they don't take up a lot of room! I also use these glass pumpkins that I got at Pier 1 a few years back and call it a day. I have a lot of serving pieces! Tons! But come Thanksgiving, I never seem to have enough. Here is the list of items I use every year and links to the ones that I have (and most are cheap!). The big key to serve ware, for me, is that whatever you buy should be dishwasher safe. It makes life ten times easier when cleaning up. Gravy Boat - I actually have two gravy boats. I use them whenever we have gravy. Ha! I pull both out at Thanksgiving, one for each end of the table. I have a pottery one and one that's white. This one at Bed Bath is $20 and would be about $15 with a $5 coupon! Platters - Platters are party life! I use them for cookies, turkey, burgers and dogs when we cook out, etc. We have about four. I have two round (this Nevaeh platter for $30 and a platter that matches our china pattern) and two oval. My two oval platters match our china patterns and aren't in stock, but this Every Day White Oval Platter at Bed Bath is perfect and only $15! I would recommend at least one, but two is really helpful! Steel Pie Server - this one is great for putting through thick crust! Electric Knife - While this isn't a requirement (you can just use a super sharp knife), it sure makes it easy to carve a turkey! I have a cheap $20 set that's similar to this one and it's worked great for the two times a year we use it! Vegetable Bowl - I have 4 of these and they're great! I use them for bread baskets, candy dishes, mixing bowls when the actual mixing bowls are dirty, etc. Now, let's get to the good stuff - food! The Good Stuff - Appetizers! I love deviled eggs. Oh so much. So much that I make them every year to make sure they are made the way I prefer (with a little pickle relish). The Pioneer Woman has a really great basic recipe that I use as my base, but she also has a ton of ideas for topping the deviled eggs. This post has 12 (twelve!) different ways to top basic deviled eggs. I think this year I'm going to put bacon on top! This Davenport tradition comes straight from those Thanksgivings growing up. My cousin Alice always had shrimp cocktail as an appetizer and my dad and I loved it! So, I continue that. I get one of the frozen trays, thaw it out the night before, put it on a cute platter and move on! Super easy and always a crowd pleaser. My favorite appetizer and "party food." Super simple - take a block of cream cheese, put it on a cute plate, dump your favorite pepper jelly on top. Add crackers and pretzels for dipping. And you're done. I've started doing half a block of cream cheese. We were wasting a full block before, so now I do half and it's perfect. My mom brought a baked brie with her one year and it was so good! It's another quick appetizer you can do if you want to shake things up. Here's an easy recipe that uses Pillsbury Crescent roll sheets. Tomorrow I'll be talking about my favorite side dishes (with links!) and my biggest shortcuts! What's your favorite part about Thanksgiving?! 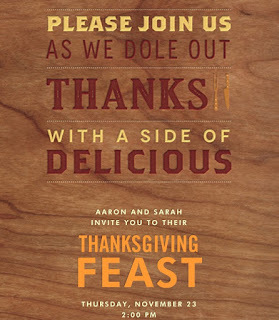 This makes me excited for Thanksgiving! We still celebrate at my parents' house, but we started doing pot luck last year. It makes things so much easier! !